Take a spin under a snow-capped city skyline and along a ribbon of ice. SEE: Millennium Park&apos;s famous Cloud Gate sculpture, affectionately known as "The Bean." GREAT FOR: All ages and abilities. Whether you&apos;re a pro on skates or still just a little bit clumsy, the iconic skating rink in Millennium Park is a must-stop for a spin on the ice—not to mention breathtaking views of the downtown city skyline and the magical sight of all those holiday lights reflected on The Bean&apos;s shimmering surface. Admission is free. But here&apos;s a tip: Each year more than 100,000 skaters visit the McCormick Tribune Ice Rink, so plan to go during off-times to avoid the big crowds and long lines for skate rentals. 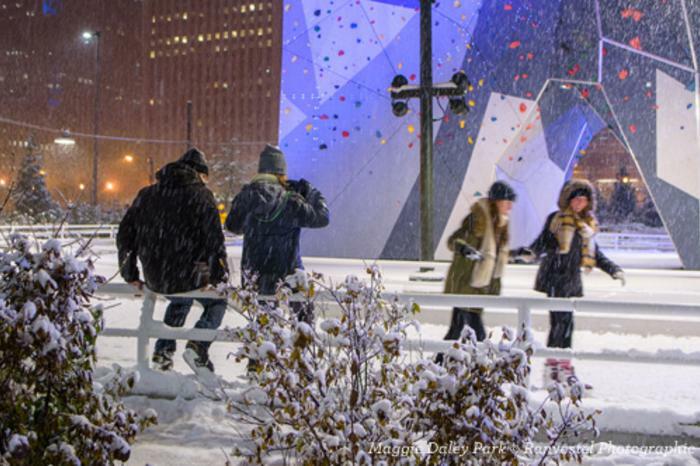 SEE: Chicago&apos;s magical downtown skating rink and expansive park. GREAT FOR: More experienced skaters given the inclines/declines and longer distance. This neighbor to Millennium Park made its debut in 2014, and offers a picturesque skating ribbon that curves through Maggie Daley Park, under pine trees and around towering climbing walls. Its path is twice the length of a lap around a traditional skating rink—which also means you should check the Zamboni schedule to avoid the lengthy ice resurfacing times! Another tip: bring your own skates to skip the rental line.